This is the description of the Go API bindings for the OLED 64x48 Bricklet. General information and technical specifications for the OLED 64x48 Bricklet are summarized in its hardware description. const UID string = "XYZ" // Change XYZ to the UID of your OLED 64x48 Bricklet. oled, _ := oled_64x48_bricklet.New(UID, &ipcon) // Create device object. Appends 64 byte of data to the window as set by (*OLED64x48Bricklet) NewWindow. 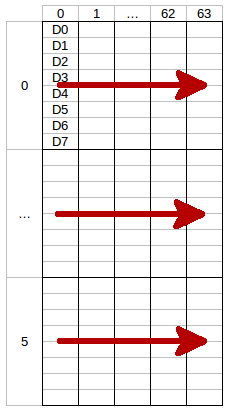 Example: if you call (*OLED64x48Bricklet) NewWindow with column from 0 to 63 and row from 0 to 5 (the whole display) each call of (*OLED64x48Bricklet) Write (red arrow) will write one row. The next call of (*OLED64x48Bricklet) Write will write the second row and so on. To fill the whole display you need to call (*OLED64x48Bricklet) Write 6 times. Sets the window in which you can write with (*OLED64x48Bricklet) Write. One row has a height of 8 pixels. Clears the current content of the window as set by (*OLED64x48Bricklet) NewWindow. You can draw to the display with (*OLED64x48Bricklet) Write and then add text to it afterwards. Returns the configuration as set by (*OLED64x48Bricklet) SetDisplayConfiguration. For getter functions this is enabled by default and cannot be disabled, because those functions will always send a response. For callback configuration functions it is enabled by default too, but can be disabled by (*OLED64x48Bricklet) SetResponseExpected. For setter functions it is disabled by default and can be enabled. See (*OLED64x48Bricklet) SetResponseExpected for the list of function ID constants available for this function. The (*OLED64x48Bricklet) GetIdentity function and the (*IPConnection) RegisterEnumerateCallback callback of the IP Connection have a deviceIdentifier parameter to specify the Brick's or Bricklet's type.